Each is comprised of a series of several tests that analyze various functions of the eye, such as color differentiation, distance vision, and peripheral awareness. A comprehensive eye exam can identify vision complications during their earliest stages, providing eye doctors the opportunity to treat them more easily. It should be part of your general wellness checkups including annual physicals, teeth cleanings and dental visits, and eye exams. A periodic eye exam can reveal underlying health issues long before other symptoms are present. In addition to identifying vision complications and eye disease, a comprehensive eye examination can also reveal conditions like high blood pressure, diabetes, a stroke, or even a brain tumor. The American Optometric Association recommends that adults under age 60 undergo a comprehensive eye exam at least once every one to two years. 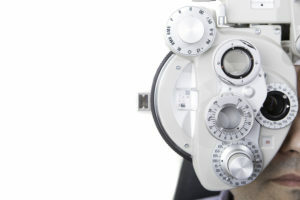 At-risk patients and patients over age 60 should get an eye exam annually. New Optix Optometry is equipped with the latest corneal topographer which is a non-invasive medical imaging technique for mapping the surface curvature of the cornea. This helps the doctor diagnosis and treat a number of corneal conditions including keratoconus and high astigmatism by fitting speciality lenses. The topographer is also a valuable instrument used to properly fit Ortho K lenses. A retinal camera takes a quick and painless digital image of our retina, the tissue responsible for allowing you to see. This technology assists in determining the health of your eyes and can help identify and manage diseases like diabetes, glaucoma, macular degeneration, and many more conditions that may affect the health of your eyes.